The End of the World Draws Near! The world stands on the brink of catastrophe. The year is 1926, and an elder being of unfathomable power threatens to awaken from its long slumber, bringing death and madness in its wake. Strange cults and unspeakable monsters wreak havoc on every continent as the fabric of reality tears itself apart, opening gates to bizarre other worlds. Only a few, brave investigators understand what is a truly happening. These tenacious souls come from every walk of life to pit their skills and weapons against the threat of the Ancient One. It falls to them to explore the most remote corners of the globe, to fight the nightmarish creatures that lurk in the shadows, and to find the answers to the ancient mysteries of this Eldritch Horror. A very "fun" game for several players, comparable to Pandemic in its uncaring, unforgiving difficulty and definitely one of our firm favourites so much so we have blinged our original copy with the Fantasy Flight characters (which Phil also stocks). In this game you and your friends are "investigators" there are quite a few provided in the box. Each of the investigators are from a variety of backgrounds, professions and social classes, loosely put together to face the unspeakable darkness which the coming of an Old God of your choosing represents. (The basic game includes, Shub-Niggurath, Yog Sothoth, Azathoth, and of course Great Cthulhu). A typical game will see your intrepid investigators race against time, losing sanity and health as the end of the world grows closer with every coming turn. At the start of the game you will have selected a particular “old one” to fight against each “old one” has its own decks and objectives. Overall, the main objective is to ensure that as a group you complete 3 of the “old ones” objectives (Or as we like to say stay alive for as long as possible)!!!! The turns are elegantly divided into three phases; Actions, Encounters, and the deadly Mythos phase. Actions: you do two of any of the following: move, purchase an item from the store, carry out a local activity, heal, and purchase a travel ticket (sea or train). Encounters: each investigator either has a location encounter, a monster encounter (if there are monsters on your tile) or a portal encounter. Encounters can be good as in some mainly location ones can add to your additional skills or provide you with spells, however, some (MOST)!! Are bad as in if you don’t succeed at the particular skill you could end up with certain conditions such as leg injury or amnesia – these effect your investigators ability to do things. The Mythos phase: After each player has carried out their actions and then performed their encounters the Mythos card is played. These cards are set-up based on whichever old one you are playing against and it will tell you how many cards and of what type. These cards are never good and will impact the board either decreasing the amount of time before the old one “AWAKENS”, adds more portals or monsters to the board or has a negative effect on the investigators i.e. removes health, sanity or clues off them. The only issue with the game would be the lack of clarity with some rules (aided partly by the comprehensive reference guide supplied within), and the general length of a typical game (in several play through sessions with 3-5 players games have stretched over 5 hours!) Regardless of the time and the issues around the rulebook (look on line for a reference guide) this is a superb game, I know this gets compared a lot with Arkham Horror and no surprises why, we had never played Arkham before this so we love this game and have no issues recommending it. We did go back to Arkham and played it we found it incredibly hard, long and fiddly in comparison to Eldridge don’t get me wrong we will play Arkham we just found Eldridge more streamlined. If you have a good bunch of friends and you have the time to play it’s a good investment. 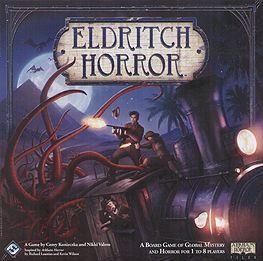 Whilst Eldritch Horror does share a lot of common ground with it's big brother, Arkham Horror, it is definitely its own game. The rules have been streamlined and once players get into the game then the turns start to rattle along quite quickly, they have also split the rulebook so you have a rulebook with the basics to get you going then a reference book with fuller details on all the nuances. The game now has a Mythos deck built according to the Ancient one you are facing, there are also decks specific to that Ancient one in play making the theme more specific in play. Clues are now much more thematic as you have to take a successful research encounter in order to collect them. These research encounters are one of the decks specific to the Ancient one in play. In order to win players need to complete 3 mysteries, another of the specific Ancient one Decks, each of these require the investigators to complete different tasks to succeed. Combat is much easier to handle with this game and again benefits from the streamlined approach taken with the other rules. Unlike Arkham Horror you are now not locked into a battle till the bitter end but rather a turn by turn battle where you get the chance to run away to lick your wounds. For me the game is much slicker, the theme is even more integrated than with Arkham Horror and the game is extremely tough. I have now played this 3 times against Azathoth and have lost each time, in fact the results getting worse each time. However, to put this into context each game has been played with different players so no real learning curve involved, other than my own. The artwork, as always, is of superb quality as are all of the components. The only gripe, which is minor really, is the way the main board folds has caused a visible crease but this is not that detrimental but is just a little annoying. Superb game that will see a lot of table time in the future.